The Mitsubishi MJ-E16V Dehumidifier is one of the best dehumidifiers available in the UK for use in the home. It is a quiet dehumidifier, perhaps the quietest dehumidifier in its class. It can truly be described as a low temperature dehumidifier and is one of the few refrigerant models that is effective as a garage dehumidifier or boat dehumidifier. The MJ-E16V combines powerful water extraction, reliability and versatility in an eye pleasing, compact design. Equally efficient in the living room or an unheated conservatory this is one of few brands that can count repeat buyers among its customers. At only 183mm (7.2in) in depth this is a small dehumidifier that occupies little floor space and will sit flush with the wall due to the use of side vents for input and output of air flow. Not only is this more space efficient but the absence of an air grill at the front contributes to the clean, modern look of this machine. Not only pleasing to the eye the Mitsubishi MJ-E16V Dehumidifier is easy on the ear. 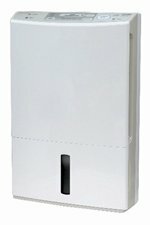 With an operating noise level of between 37 and 41 dB this dehumidifier is one of the quietest available. The variation in noise level depends upon which of the five available drive modes has been selected but, even on its least quiet setting it is still far quieter than many other dehumidifiers. For comparative purposes, because decibels increase according to a logarithmic scale, not a linear one, an increase of 6dB represents a 50% increase in noise, as experienced by the human ear. Noise is always an issue with dehumidifiers. The refrigerant process, common to most domestic models, requires the operation of both a compressor, as in a refrigerator, and a fan. Many people who have never owned a dehumidifier before are surprised by the noise level of any dehumidifier but they don't come much quieter than the MJ-E16V. If your dehumidifier has to be moved the manageable weight (11.7kg), slim-line design and built in carry handle make the Mitsubishi MJ-E16V Dehumidifier easily portable. Please remember always to use the handle. Dehumidifiers, like refrigerators, are sensitive to movement and the machine needs to remain vertical to avoid damage. This dehumidifier comes with all the features most likely to be needed in the home. The Mitsubishi MJ-E16V Dehumidifier is equipped with a humidistat which, although not adjustable, ensures that the dehumidifier will not run once relative humidity drops below 55%. Comfort for people requires a relative humidity range between 40% and 70%. Protection of our belongings requires a range of 40 to 60%. At 55% we should all be comfortable and our possessions safe from condensation, damp and mould. This dehumidifier is popular, for example, with museums that find 55% RH ideal for their exhibits. At a relative humidity approaching or below 40% excessive drying can damage the things we value, particularly wood and leather. This feature keeps us comfortable, protects our property and saves energy by ensuring that the dehumidifier does not run when it isn't needed. A hot gas defrost system is also included with the Mitsubishi MJ-E16V Dehumidifier. One of the consequences of the refrigerant process used to condense water from the air is that the refrigeration coils, over which the air is passed, can start to collect ice when the temperature is low, below about 16°C. Hot gas defrost reverses the flow of air, passing warm air over the coils until the ice melts and drains into the water container. This procedure takes about five minutes, after which the dehumidifier resumes its work. Without this feature the machine would simply stop until the ice melted, stopping the dehumidifier from working for much longer periods and reducing its effectiveness. This is why the Mitsubishi MJ-E16V Dehumidifier is able to operate effectively in temperatures as low as 1°C, a genuine low temperature dehumidifier. Even inside the home the temperature can fall low enough to cause icing, especially at night or when the house is empty in cold weather. Outside the home, in a garage say, this is even more likely. Hot gas defrost allows this machine to operate quite happily and effectively in a garage, or other cooler place, and many people use it successfully for this purpose. The Mitsubishi MJ-E16V Dehumidifier also comes with a continuous drainage facility. In order to keep the size of any dehumidifier reasonably small the capacity of the water collection container is always relatively limited, in this case 4.0 litres. To prevent spillage the dehumidifier cuts out when the container is full so it requires emptying once or twice a day. This may be a chore you would rather do without, especially if the appliance is in your garage, and is impossible if you are away from home. Continuous drainage allows the dehumidifier to drain water, via a small (15mm) plastic pipe, to a drain or sump. The pipe can usually be obtained from the dealer supplying the machine. The Mitsubishi MJ-E16V Dehumidifier operates in five drive modes, with varying fan speeds. When the air is cool there is a "low temperature mode". This should be used when the "cold" lamp lights up. In this mode the machine controls the air flow, increasing it when the temperature is lower. In this mode the noise level can climb to 41 db. In "laundry mode" the dehumidifier operates at a high level for up to 12 hours and ignores the humidity level in order to dry your clothes. This is the other mode in which noise can rise to 41db. "Auto mode" is the simplest choice since it automatically adjusts the operation of the dehumidifier to maximise your comfort. It does this by balancing the humidity and temperature readings and switching on and off to maintain a pleasant environment. Noise levels in this mode may vary within the range stated in the table. You may also select "low mode" at which the dehumidifier runs continuously at a low level, regardless of the humidity. In this mode the noise level is only 37 dB. The Mitsubishi MJ-E16V Dehumidifier is fitted with two filters. One is the same as those normally found in all dehumidifiers and removes dust particles from the air to protect the appliance. The second filter is to purify the air and is used during all four of the above modes. The air purifying filter should be replaced annually. The fifth mode is "air purifier mode" during which the dehumidification process is switched off and the machine operates solely to purify the air. While not a substitute for a dedicated air purifier this is an added benefit. This is also a quiet mode as the compressor is not operating. Other features of the Mitsubishi MJ-E16V Dehumidifier include an off-timer which can be set to switch the machine off after 2, 4 or 8 hours and an auto restart feature which switches the dehumidifier back on following an interruption of the power supply. This latter feature is particularly useful when you are away from home. The most valuable characteristic of the Mitsubishi MJ-E16V Dehumidifier is its reliability. Customer experiences tell us that the appliance will work reliably and effectively over a number of years and Mitsubishi Electric's records show that less than 1% of Mitsubishi dehumidifiers fail during the first year following purchase. In dehumidifier reviews written by consumers the Mitsubishi MJ-E16V emerges with flying colours. It has been enthusiastically praised for its power and effectiveness in keeping smaller homes completely free of mould and condensation. Users have also confirmed that this is a quiet dehumidifier, much quieter than other dehumidifiers they have owned. The Mitsubishi MJ-E16V has been chosen by some for use in a second home specifically for its capacity for unattended operation. The most appreciated features are continuous drainage and auto-restart. Other users confirm the effectivenss of the Mitsubishi MJ-E16V in cool areas, including garages, boats and caravans. Consumers who have used the Mitsubishi MJ-E16V to dry washing indoors have commented appreciatively about the effectiveness of "laundry mode" and confirmed energy savings from not using their tumble dryer. Negative comments are few. Some have complained that the power cable is too short. Others have been unhappy that the humidistat is not adjustable. An adjustable humididstat is fitted on the MJ-E16VX model. All consumers are pleased with the build quality and reliability of the Mitsubishi MJ-E16V. In our view the Mitsubishi MJ-E16V Dehumidifier is an exceptional dehumidifier with an outstanding performance. It is effective as a dehumidifier for the home. It is equally effective as a garage dehumidifier, a boat dehumidifier or for use in any other cool area. It has a wide range of features and is versatile and controllable, with five operating modes. It is a small dehumidifier with compact dimensions and of light weight. It is stylish and pleasing to the eye. Above all this is a reliable dehumidifier that should repay the extra purchase cost with a long and trouble free life. We recommend this dehumidifier to our visitors without reservation.